If you come to Point Richmond, there’s no doubt you will want to take a drive through one of California’s oldest tunnels, the Ferry Point (Dornan) Tunnel. And when you do, you will exit on to a road named Dornan Drive. The roadway is named after the in-laws of Mid Dornan, the guest in this episode of Stories from The Point. At a very healthy 90-years old, Mid is a beautiful example of living history. In the early 1900s, Mid’s father-in-law opened and ran one of Richmond’s first and most successful general stores. Moving to Point Richmond in 1946, Mid even spent some time behind the cash register at the once popular retailer. There is no doubt that Mid has built a solid bank of knowledge about the area through her background and 67 years of residence in The Point. In addition to the many wonderful anecdotes that she shared, I was particularly touched by a more personal thread that she weaved within her recounting of The Point’s history. In this audio postcard we are privileged to the story of how Mid met her husband and his ultimate, and very unfortunate, untimely death. I hope to be able to put together another postcard with some of Mid’s other stories. In the meantime, I think this one will give you a bit more pause as you drive through the Ferry Point Tunnel and on to Dornan Drive…it certainly does for me. 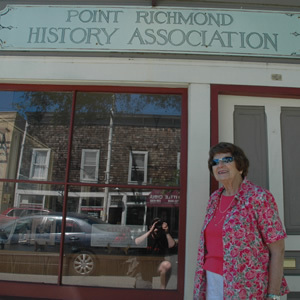 Please be sure to visit the Point Richmond History Association online (Mid is the President). Also, I love to hear from you, so leave any comments that you may have about this episode of Stories from The Point. All donations go directly and securely to my web host and pay for the hosting of this site and the streaming of all the great stories. I truly appreciate any help you can offer. Email Updates! Get an email when a new story is posted.